We had a really good just "chill" weekend. On Friday Hudson wrote his name by himself for the first time. I was so proud of him! My dad came and stayed with the boys while I went to get my hair done-- it needed it badly! Friday night I made a SUPER yummy Hello Fresh meal. They just keep getting better and better and every week it is SO fun. It's completely customizable so you can get them as little or much as you want. The food is SO good and so good for you and there are 5 meals you can choose from every week. My grocery bill and our eating out bill has gone down significantly since starting this box service! I made another one for lunch on Saturday. This is actually a salad that I love getting at a local restaurant so it was fun to be able to learn how to make it myself! Saturday Bryan worked on adding some stuff to his Jeep and we all just kind of chilled. It's rough being 2. HA! 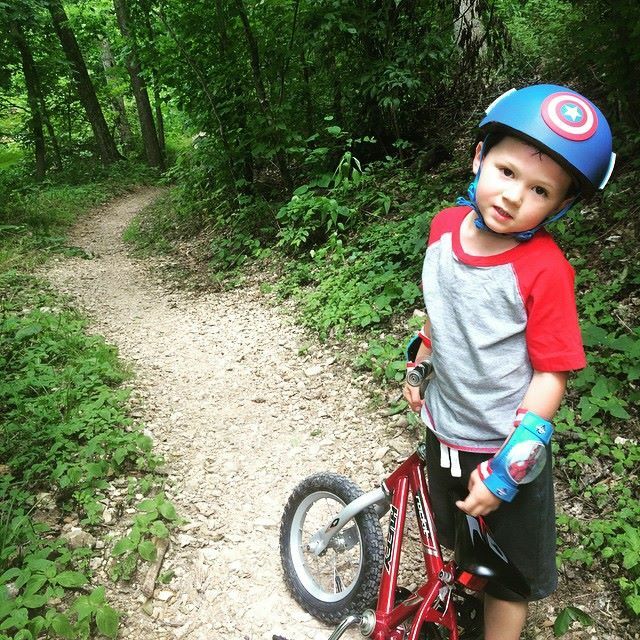 Bryan and Hudson went out bike riding on the trails and had a great time. I can't believe my baby is big enough to ride on the trails!!! Saturday night my parents took Hudson to the baseball game so Bryan and I took Rhett on a little family date downtown to the food trucks. Then Sunday Bryan smoked a brisket and I went to lay out at the lake with my mom and then came home and let the boys play in the yard with the sprinkler. Our friends came over for "Sunday Night" dinner and this Brisket was the best BY FAR that Bryan has ever done. SOOOOO good. Yesterday we met some friends at the park and it started raining so we let them play in the rain. I'm pretty sure they thought it was the best thing ever. Hope you had a good weekend and that you're having a great week! Happy Tuesday!